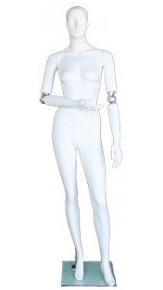 Our glossy white female mannequin has sculpted facial features and movable elbows. Detachable arms and torso for easy dressing. Comes with a 15" glass base. SEE match Male Posable arm mannequin - click here!